Many states require that the Tenant’s Security Deposits be held by the Property Manager and accounted for separately, requiring a separate bank account to hold those deposits. Whether you hold the funds in ‘Trust’ or pass the funds to your Owners, the Tenant File will allow the different methods of posting Security Deposits. The Tenant File allows for up to 10 bank accounts. One main Property Management Account, called the Primary Account, and up to 9 other bank accounts that the User sets up. If your state requires that you hold the Security Deposit in a separate account (and not transfer the funds to the Owner), then you would utilize one of the additional accounts (other than the Primary Account) for those funds. When a new Tenant is entered into the system, you will need to process a ‘Charge’ to the Tenant Ledger with the amount of the Security Deposit required (i.e. ‘Security Dep Charged’), similar to charging a Tenant Ledger with their Rent. If the Tenant has an additional Deposit required, such as a ‘Pet Deposit’, you would also process that charge. (i.e. ‘Pet Dep Charged’). When the Security Deposit is paid, you ‘Credit’ the Tenant Ledger (using ‘Deposit Received’), which will zero out the deposit charged. The amount of the ‘Security Deposit Received’ would need to be entered under the Tenant information field titled ‘Deposit 1’. You would do the same with the ‘Pet Dep Received’ and enter the amount under ‘Deposit 2’. This process of posting the ‘Security Dep Charged’ and the ‘Security Dep Received’ is a ‘wash’, yet it allows for a history of what the Tenant has paid and what you, as the Property Manager, are holding in escrow for that Tenant (or has passed on to the Owner). The Tenant File Accounts are set to post the ‘Security Dep Received’ to the Tenant ONLY due to the fact that a majority of the states are required to hold those funds. IF you do not hold those funds and pass the Deposits on to the Owner, then you would need to modify your account settings under PREFERENCES > ADD/EDIT ACCOUNTS and change the ‘POST TO’ Ledger Status of the ‘Security Dep Received’ to post to BOTH (T/U). The deposit income would then be posted to both Tenant and Unit and the amount(s) would be included in the ‘Paid to Owner’ check. When the Tenant vacates the Unit, if you are holding the funds in ‘Trust’, you would need to refund to the Tenant the portion of the Deposit(s) that remain once all repairs and expenses have been processed against them. This new feature will allow you first transfer the funds from the ‘Security Deposit’ Bank Account to your ‘Operating’ Bank Account (if need be), transfer the funds back to the Tenant Ledger, subtract any expenses incurred from the Deposit, refund the available portion back to the Tenant and Forfeit any funds to the Owner. And, of course, all deposits and checks will be automatically created for you. Simply click onto the dropdown list to select the desired Tenant and the currently entered Security Deposit amount will be filled in for you. This information is pulled from your Tenant Ledgers in the ‘Deposit 1’ and the ‘Deposit 2’ fields, therefore if the information does not show to be correct, exit and view the Tenant Ledger. It is very important that you make sure that all of the information and accounts shown on your screen are correct prior to proceeding. Your first step would be to indicate if you keep the ‘Security Deposit’ funds in a separate Bank Account (i.e. Trust Account), but write all of the checks from an ‘Operating Account’. If so, the program will transfer those funds from one account to another if you click in the upper right corner the option button labeled ‘I first transfer from escrow to another account’ under the section titled ‘How do you handle your security deposits?’. It will also allow you to create a check and deposit for the transfer from one account to the other (if you choose). Once you select the ‘transfer’ option, the screen will display other options allowing you to show the transfer, then to create the disposition of the security deposit. If your accounting system is set to pay expenses from the ‘Trust Account’, you would indicate ‘I don’t make an account to account transfer’ and checks would be created for your ‘Security Deposit Account’. Transfer Security Deposit into Tenant Ledger: This will display the total funds (as entered in your Tenant Ledger information) that will be temporarily credited to the Tenant Ledger. Typically, this is the full amount of the original received ‘Security Deposit’ entered. The purpose of this step is to show that money was transferred out of escrow (your ‘Security Deposit Bank Account’) and back into the Tenant’s Ledger. You can prompt the program to create a deposit into your Operating Account (if you choose). Subtract any amount that you want to charge the Tenant: This section will allow you to subtract the amount of any expenses incurred that you want to deduct from the Security Deposit prior to creating the refund. If you have posted the expenses previously into the Tenant Ledger when paying Vendors for repairs (for example), you would skip this step. Note: If you have posted the expenses for repairs into the Unit Ledger, this section will allow you post a ‘Forfeited Deposit’ into the Unit Ledger for those expenses by placing a check mark at ‘Click here to forfeit this amount to the Owner (Unit Ledger). Once selected, the screen will include the information of the amount forfeited and the Account Defaults that will be used. Tip: If you create checks to your Vendors for payments of Work Orders or repairs to the Units that are being vacated and you post those expenses to your Unit Ledger, you would want to allow the program to create the ‘Forfeited Deposit’ posting to the Unit Ledger to offset those expenses. If you create the checks to your Vendors and post those expenses to the Tenant Ledger, you would not forfeit the funds to the Owner, but utilize the remaining funds (not refunded) to offset the expenses. 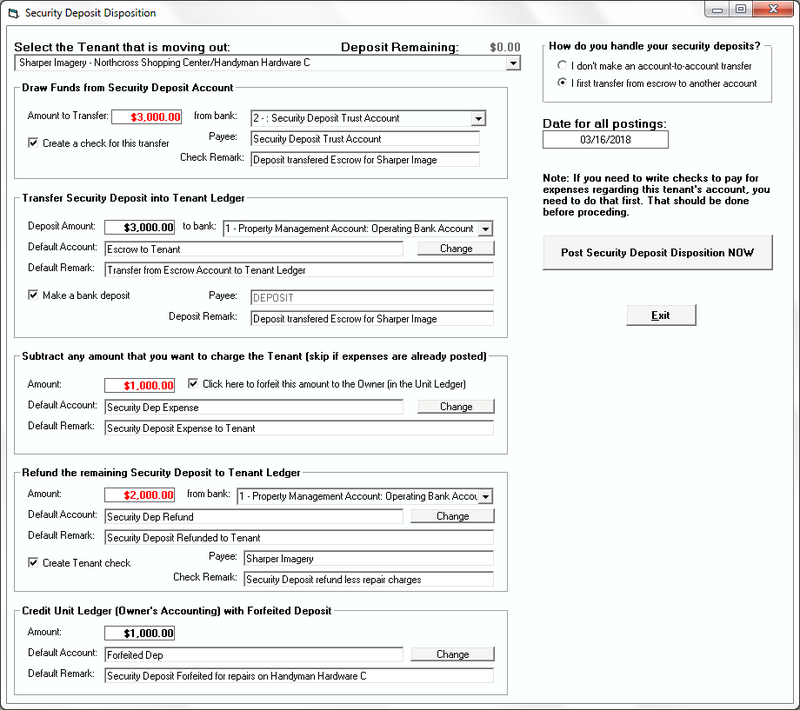 Refund the remaining Security Deposit to the Tenant Ledger: This is the final amount to be refunded to the tenant. If you want the Tenant File to create a check to the tenant, just click the ‘Create Tenant check’ box and enter the tenant name and any remark that you want to show. Important Note: Prior to using this feature, you must make sure that all of the required accounts are set up under PREFERENCES > ADD/EDIT ACCOUNTS. For new users, these accounts are included in your setup. If you have recently updated your Tenant File program to Version 8, you will need to follow the instructions included with your order to add the required accounts. Use your own wording for the Account Names that you set up. Once the Account Names are set, you will need to click into PREFERENCES > EDIT ACCOUNT DEFAULTS and set your defaults for the new accounts. Remember that any checks created through this process are not posted until you print the checks. If you do not have the current Tenant File Version (and you should), you would need to manually make the transfers, postings, checks and deposits that the ‘Security Deposit Disposition’ procedure will do for you automatically. The manual entries would include posting a ‘Security Dep FROM Escrow’ (Income Account) to bring the funds back into the Tenant ledger. If you use a separate account for your Security Deposits, you would write a check out of the ‘Trust Account’ and create a deposit into your ‘Property Management Account’. You would then pay out any expenses incurred by the Tenant (checks created to Vendors, etc. ), and then write a check (Security Dep Refunded) to the Tenant for the remaining funds. If any of the deposit is to be forfeited to the Owner, you would post that Expense to the Tenant ledger (Tenant Deposit Forfeited) and then post that same amount to the Unit Ledger under ‘Deposit Forfeited’. This takes into account that you are keeping your security deposits separate from your property management operating account. If your accounting system is set to pay expenses from the ‘Trust Account’, you will still need to post the transactions in the Tenant ledger as indicated above to show where the funds were paid to. The transfer of the Security Deposit when a Tenant moves out of the Unit should be done prior to making that Tenant ‘VACANT’ and moving him/her to the ‘Inactive Database’. You are free to set up as many Account Categories as you wish and use your own method. Since states have different regulations regarding handling security deposits, we cannot give advice on the method you should use.